Making a big pot of chili on a cold day is just perfect. When I’m cold I definitely don’t crave salads – I want something warm, healthy & satisfying. We made chili on Sunday, and added some fall flavors by using butternut squash and PC Free-From pork sausages from Superstore. I really like this brand of sausages because they’re nitrite-free (preservative) and don’t contain any hormones or antibiotics. 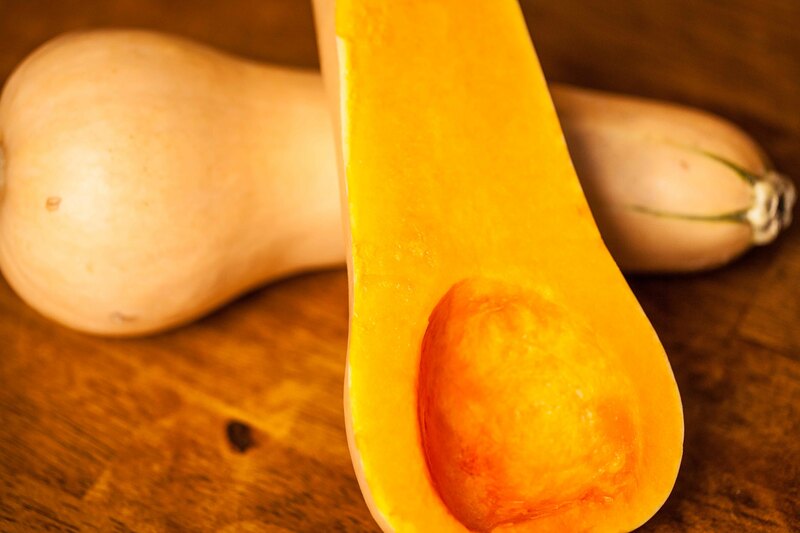 Butternut squash (along with many other types of squash) is in season right now in Ontario until March so it’s a great time to experiment with it. They are a bit of pain to peel & cut, but you can also use the frozen, pre-peeled and pre-chopped version – a huge timesaver, and exactly the same nutritional value! They have a creamy, sweet flavour, and are so good for you – a great source of beta-carotene, vitamins & minerals, and only 82 cals per cup. It’s also really versatile. You can roast it for a simple side-dish, add it to pasta, stir-fries, chili or stew. I even came across a recipe the other day where it was used in muffins! And the great thing about making chili on Sunday is you can have it for dinner that night, lunch the next day, and than freeze the rest for later. Changing your diet with the seasons is a great way to plan your meals. Not only will you save money, but eating seasonally usually coincides with what our bodies crave during those seasons. Think about all the fruit & crunchy veggies that are in season in the summer when it’s hot, and we’re craving raw, cooling foods. In the fall & winter when it’s cold; root veggies & squashes that usually require cooking & being served warm are available. Eat seasonally, and try this fall twist on chili! Chop onion, celery, butternut squash (or de-thaw slightly if using frozen) & peppers. Remove sausage meat from casings (kind of gross – my husband always does this part). In a large pot, heat oil on medium-high, and brown the sausage for about 10 minutes, breaking it up into small pieces with your stirring spoon. Add chopped onion & celery, and sauté for 5 minutes with the sausage. Add butternut squash, pepper, garlic, half the spices and 2 cups of stock. Turn heat down to medium-low, cover & cook for 12-15 minutes. Add diced tomatoes, beans, and the rest of the stock & spices, sugar and salt & pepper. Stir to combine. Bring to a boil. Once boiling, turn heat to low, and let simmer for 15-20 minutes or until vegetables are cooked to your liking. Serve in bowls, and top with diced avocado – enjoy!